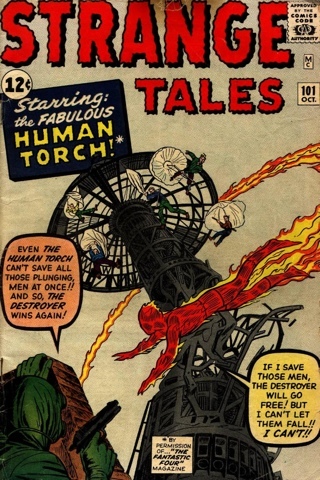 Starring the “Fabulous Human Torch”, this was about as exciting as an issue of the Incredible Hulk. 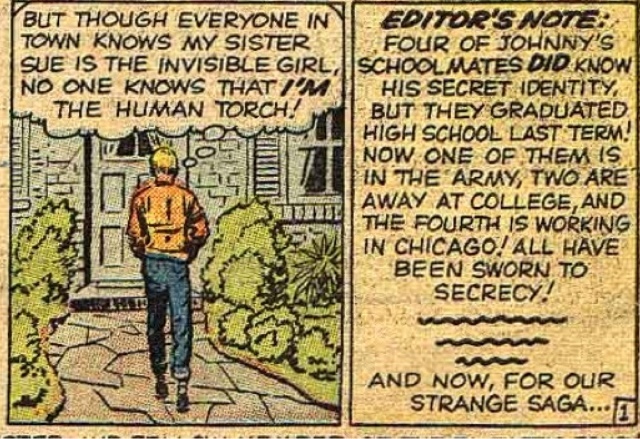 The issue begins by telling us (once again) why Johnny Storm is a cool kid. We get another glimpse of his origin story, followed by an explanation as to why his identity is still a secret, despite the fact that he made it a very public thing in other stories. Those must be the most reliable group of kids in the world. We get a tour of his dorm room, and it’s pointed out to us that he gets nightmares which spur his flames. To prevent his room from catching fire, Mr. 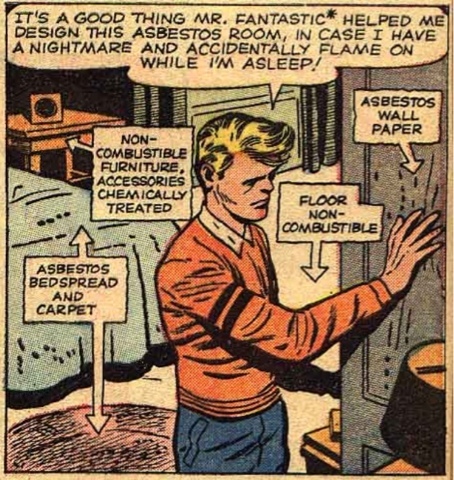 Fantastic, the brilliant scientist that he is, designed the entire room out of ASBESTOS. 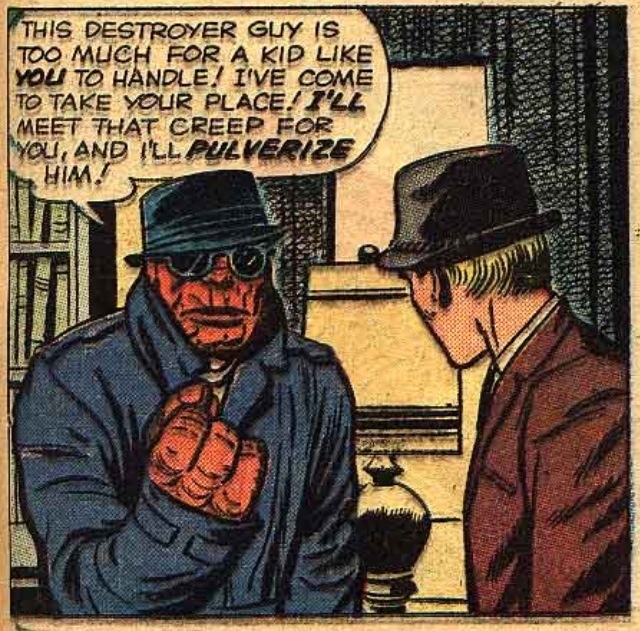 Surely he could have come up with something that wouldn’t cause poor Johnny any long-term health problems, but maybe there was a lot going on in those pre-Galactus days. Pay very close attention to the room. 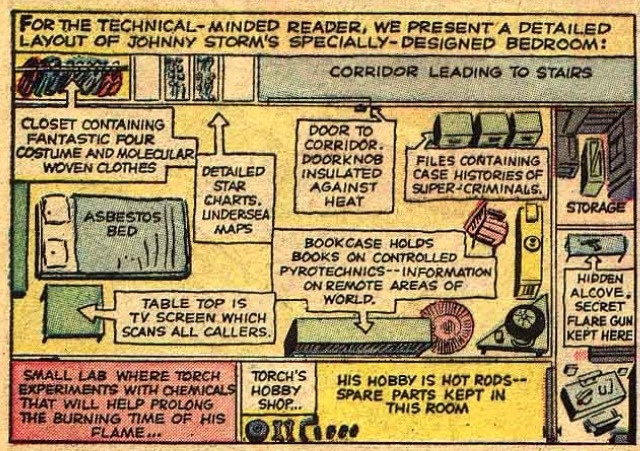 There’s also a map of Johnny’s room. Last time I mentioned that this type of thing is pretty cool, but really, it’s just his dorm room. I could really care less about it. I feel bad though, it looks like it was well thought out. Now, look back at the last photo, and point to where the hell Johnny is standing. The story moves on to feature a villain who absolutely hates theme parks. Time and time again, he pops up, after sending in threats, to sabotage the newly built rides. 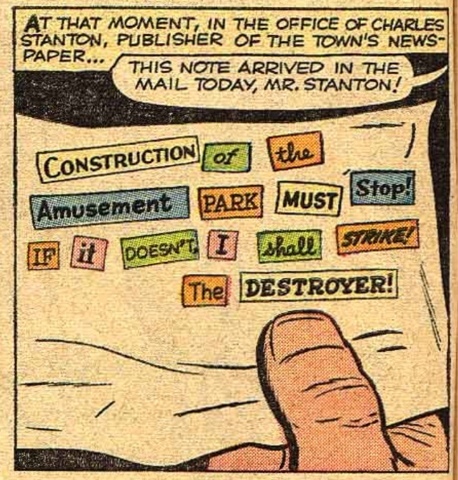 Johnny Storm is a smart lad, and begins to realize that the madman is only attacking the tall rides (another one of those, “how the hell would he make that conclusion” kind of moments). Move over Joker, there’s a new villain in town, and his name is The Destroyer! 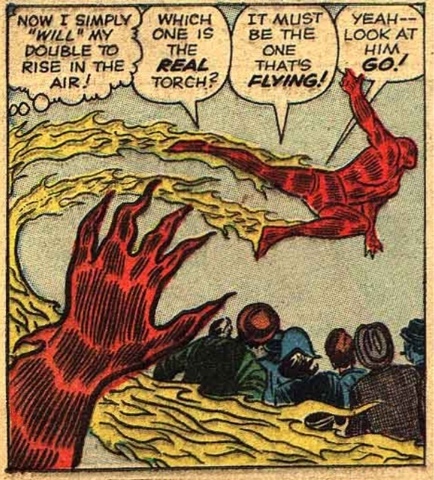 At one point, the Human Torch seems to get a new power: now he can make fire clones of himself. It wasn’t in the middle of battle, but merely just to distract onlookers from seeing his true identity. One Human Torch is quite enough for me to have to endure right now, thanks. If Johnny just said “erm, OK!”, I guarantee this issue would have taken an awesome turn. 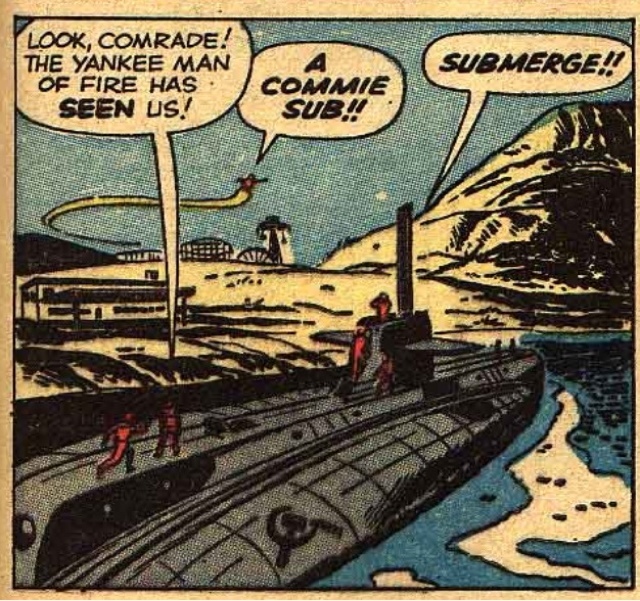 The Soviets have a secret submarine parked in the bay, so the villain wanted to sabotage tall rides that might jeopardize their secrecy. Ugh. Bring me monsters, aliens, and more dynamic villains please. Also, I should also say that I’ve just never been a huge fan of the Human Torch, so it makes this story MUCH more difficult.